A movement sport in which gymnasts demonstrate a combination of balance, strength, flexibility, agility, endurance and control. Both individual and team-based gymnastics competitions can be held across a variety of different disciplines. 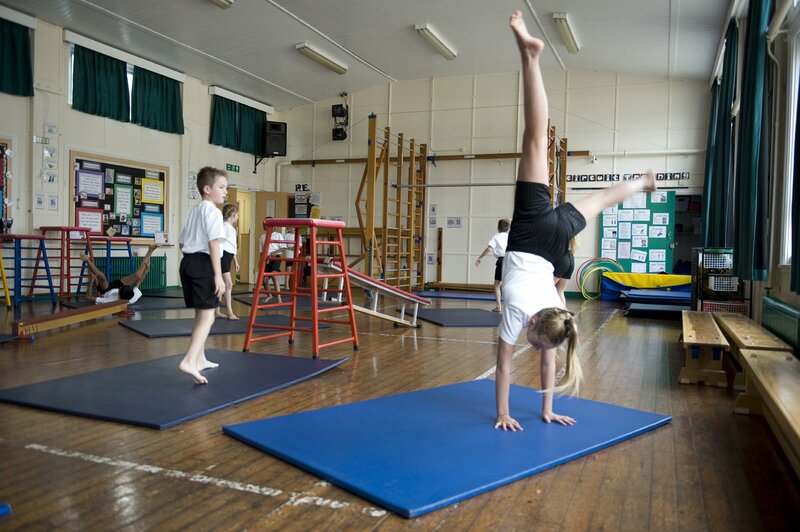 These include Artistic, Rhythmic, Trampoline, Tumbling, Double-Mini Trampoline (DMT), Disability, Acrobatic, TeamGym and Aerobic. To find out more about each of the disciplines listed above please visit the Discover Gymnastics website. Gymnastics has featured at every Olympic Games, dating back to 1896, although women have only been permitted to compete since 1928. Events are traditionally held on a variety of apparatus – horizontal bar, parallel bars, pommel horse, rings, and vault. The most successful Olympic nation in gymnastics is the Soviet Union, who has 182 medals to their name, well ahead of second place United States who has 114. Team GB have 14 medals, putting us in 22nd place, although half of those came in Rio in 2016. School Games alumni Max Whitlock became the first British athlete to win an Olympic gold medal in gymnastics in 2016, winning both the floor exercise and pommel horse events, as well as coming third in the team event. Larisa Latynina – Only Michael Phelps has won more Olympic medals than this Soviet gymnast, who won 18 in events between 1956 and 1964, including nine golds. Two more Soviet gymnasts, Nikolai Andrianov and Boris Shakhlin, also appear in the top five of the list of most successful Olympians and between them they account for 46 of their nation’s 182 gymnastics medals. Max Whitlock – the MBE had already enjoyed plenty of success before his golden year in Rio. His victories in Brazil followed double bronze, in the team event and the pommel horse, in the London Games of 2012, as well as five World Championship medals – including pommel horse gold in the 2015 event in Glasgow. British Gymnastics – please click here for more information. In order for a competition to be considered part of a School Games provision, it must follow a School Games format. All School Games registered users have access to our sport formats and can access the formats for this sport by clicking the button below. Alternatively, you can download the full Gymnastics format pack by clicking here.